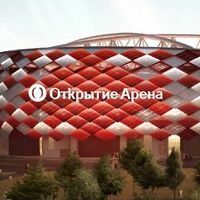 Yesterday Spartak Moskva and Otkritie sealed their naming rights deal at the construction site in northern Tushino district. Though name is to change formally from 2014/15, already now a large banner was revealed on the concrete skeleton of future 44,000-seater. Contract that will span over 6 years was revealed to bring RUB 1.208 billion to Spartak, meaning income of €5 million (or $7m) per year. This extra revenue is supposed to aid Spartak’s new training complex. Also yesterday club owner Leonid Fedun confirmed that final budget may be much higher than initially expected, maybe even reaching $500 million (€375m).